The thanksgiving celebration for the life of Wycliffe 'Steely' Johnson was indicative of how he lived and the many lives he touched. You felt his energy in the music and captured his essence in the speeches made by his peers and family; even the unscripted surprises, generated laughter, reflecting one of the affectionate labels used to describe him - stand up comic. The programme was printed as a CD pamphlet, and each page was utilised to show different aspects of his life, pictures of his children and mother, and pictures of him with his many musical moments, especially the ones with his musical partner Clevie. The order of the service was placed conveniently, in the middle of the pamphlet, and it well thought out execution, allowed us to capture the many aspects of this legendary man. 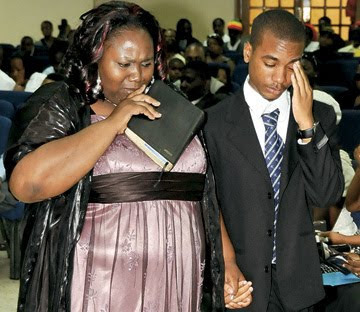 The Swallowfield Chapel was packed with family members, a well representatives of the music fraternity, members of the 12 Tribes of Israel, friend, fans and well wishers. The praise and worship section was "reggaefied", some of the usual songs were sung on complementary dancehall rhythms, which added a nice touch. Each item that was sung or spoken made one learn more about Steely. If a stranger was sitting in the congregation, they would have left knowing so much more of this reggae icon. There were remembrances and songs shared both by family members and his musical family. The eulogy was read by lifelong friend and the other half of the musical duo Cleveland 'Clevie' Browne, who was greeted with a standing ovation by the room. 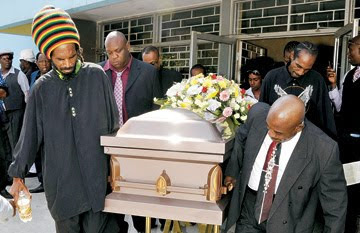 Another poignant moment was the laying of the red roses by some of reggae's best producers, on Steely's coffin. Each was called out individually, and given a red rose which they placed on the coffin. This brought tears to some eyes, as the faces of the men showed everything. Their respect for this moment was seen in their faces, unmasked, as each have worked somewhere in the past, and on some of their biggest hits with this genius. In the room, the camaraderie and love amongst people in the industry was palpable. It was obvious that people knew each other for years, and as Rev Al Miller alluded to, the fact that death was a moment for contemplation. It appeared as if Steely's death brought this to many sitting in the pews. From all indications he will be missed, not only for his groundbreaking shift of a whole genre of Jamaican music, but also his humour, enthusiasm, and his flaws.